My dream Porsche lives in the spirit of the 914 and the 924: A compact, lightweight, mass-market, rear-wheel-drive sports car. It has a long hood, short overhangs, and a roofline that alludes to Porsches of today and yesterday. Much more at thirdwigg.com, and the full Flickr gallery may be seen here. Hope you all enjoy, and good luck to all the contestants. Nice! I like how "clean" it looks. The modest scale is something I really like as well. It's compact without feeling too short. Great model. The white works really well. I was starting to get bored with all of these Porsche threads, to the point where I just skip over them. When I saw that you were the poster I had to give it a look, as your creations are usually top notch. I wasn't disappointed. The looks are great, and the transmission and the suspension/steering geometry are the icing on the cake. Well done Thirdwigg! Great Porsche from you again! I have thought you might enter with your 964 which wasn´t bad as well. Of course I know that you prefer sturdy and rigid connections, but one little thing that bothers me a bit - the characteristic Porsche roofline should be sloping towards the rear at the B-pillar... Anyway everything compact, clean and well designed as usually ! I love white cars and this one is just beautiful. One question though - are you sure you have Ackerman steering there? As far as I can see, pin with towball mounted to lower A arm is inline with axle towball mounted to steering link, there is no angle between them. Thanks all for your praise. When I saw that you were the poster I had to give it a look, as your creations are usually top notch. I wasn't disappointed. I have thought you might enter with your 964 which wasn´t bad as well. Of course I know that you prefer sturdy and rigid connections, but one little thing that bothers me a bit - the characteristic Porsche roofline should be sloping towards the rear at the B-pillar... Anyway everything compact, clean and well designed as usually ! Thanks. I felt weird about posting a MOC that was build previously, so I figured something new is more in line with my understanding of the contest. I tried a couple of designs for the roof, but rigidity won out. 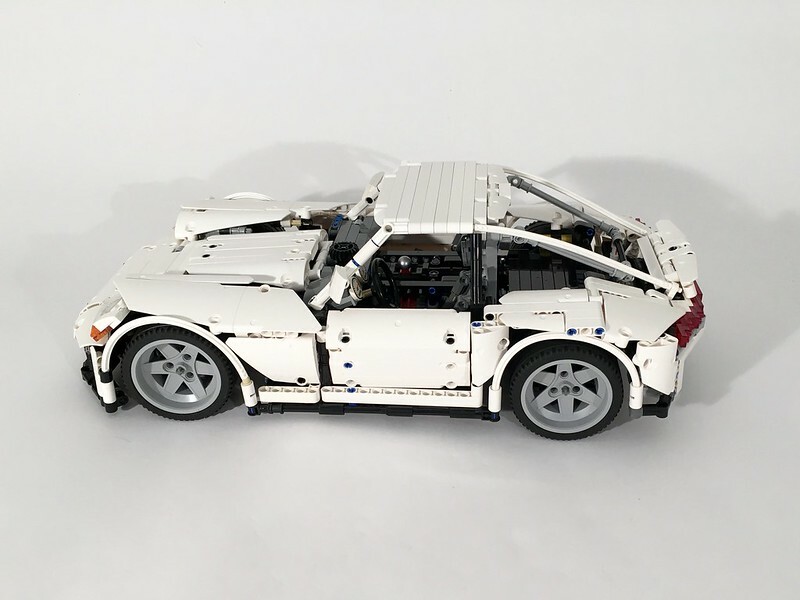 Ugh, curves in LEGO. The beltline of the car is so flat that I felt the flat roof worked well enough. It is hard to see, but the steering link point is one stud inboard of the upper and lower steering pivot point. Do you mean 1 stud closer to the body or 1 stud further? Your model is very clean and beautiful , I would like to see our models together (like old vs new). Maybe this picture will help. The steering rack is mounted 1 stud closer to the centerline of the body, and the A-Arms are mounted 1 stud further away from the centerline of the body. 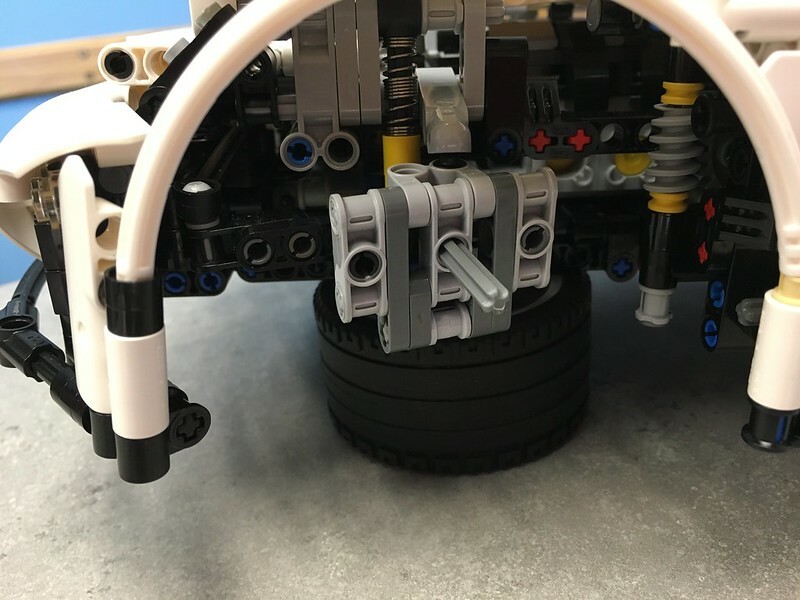 The steering pivots are 17 studs wide, and the steering rack is 15 studs wide. 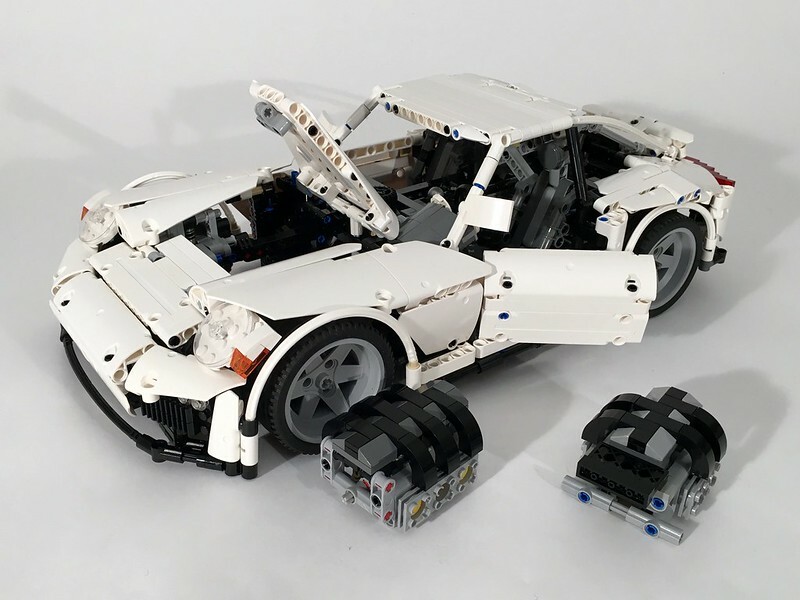 According to this: http://www.brickshelf.com/cgi-bin/gallery.cgi?i=5022199, when you place the gear rack in front of the front axle, steering pivot points should be further from the centerline of the car, so the lines going through them and through A arm pivot points would converge in the rear differential. 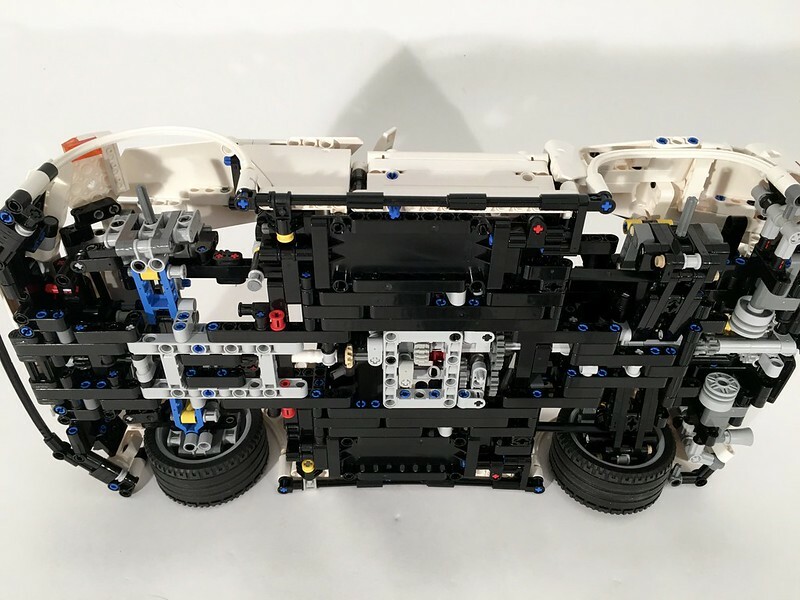 According to this: http://www.brickshel...y.cgi?i=5022199, when you place the gear rack in front of the front axle, steering pivot points should be further from the centerline of the car, so the lines going through them and through A arm pivot points would converge in the rear differential. Hmmm. It seems you are right. I've been doing it wrong this whole time. In my effort to get the steering rack in front of the engine, I failed to see how the geometry needs to be changed. Thanks for the catch, I'll change for the next car. As long as you say that it is solely a track car you're good to go, since racing vehicles, such as F1 cars, use inverse Ackerman geometry. OK. It's solely a track car. Now the roll cage makes a little more sense too. I wish you good luck in the contest, because I think this is one of the best entries so far. Fantastic model. Really good read on the design process. When you're building the model, you said you designed the engine, chassis, and transmission within the first week. How do you determine the size of the chassis and the proportion the rest of the car body around it? 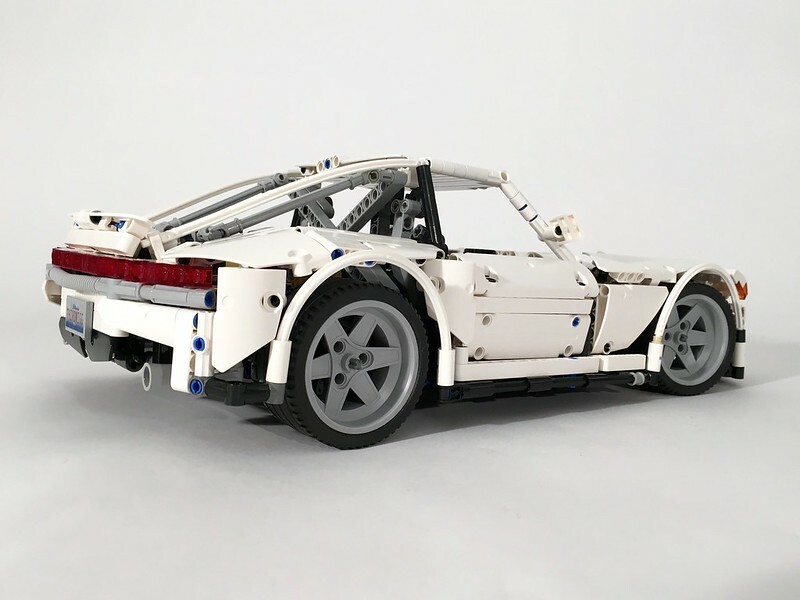 Is this something you workout beforehand when building the chassis, or do you build it first and then fit the body around it? Thanks. This car was built rather organically, though assuming a 25 stud wide car. I built the engine, transmission, and suspension units quickly, then tied it all together with a simple chassis. 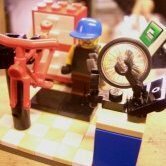 I guessed (which I don't normally do) on the size, particularly the wheelbase (32 studs). Then I build the body around it, while keeping some design theme priorities (long hood, short overhangs, Porsche rear, flat beltline, round headlighs, and thin taillight). Tying all the bodywork together took a lot of time.